Growth hormone (GH) is the hormone that is primarily responsible for our growth from children into full sized mature adults. GH continues to play a critical role in health promotion even after we have stopped growing. Some adults will present with a deficiency of GH. Without adequate levels of endogenous GH, patients may suffer from, an imbalanced ratio of bad to good cholesterol, improper body composition (too much fat, and not enough lean muscle), and insufficient bone densities. Some people do not make enough GH naturally, and they will benefit from GH supplementary treatment. Adults who do not produce adequate levels of GH have a condition called aGHD. GH is produced by the pituitary gland in the hypothalamus of the brain. Harm to the hypothalamus through disease, trauma, or radiation treatment, may result in an underperforming pituitary gland. Your doctor can test the performance of your pituitary gland, to determine if you may be a candidate for GH therapy. 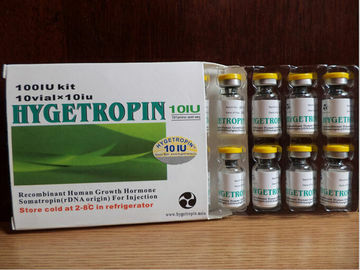 Hygetropin vials are air-vacuumed to preserve the powder. Before using an Hygetropin hGH vial you should let all air out of the vial, this should be done only once for every new vial to be used. It can be done by inserting a bare needle or one attached to a syringe into the vial to let all air get out of the vial. 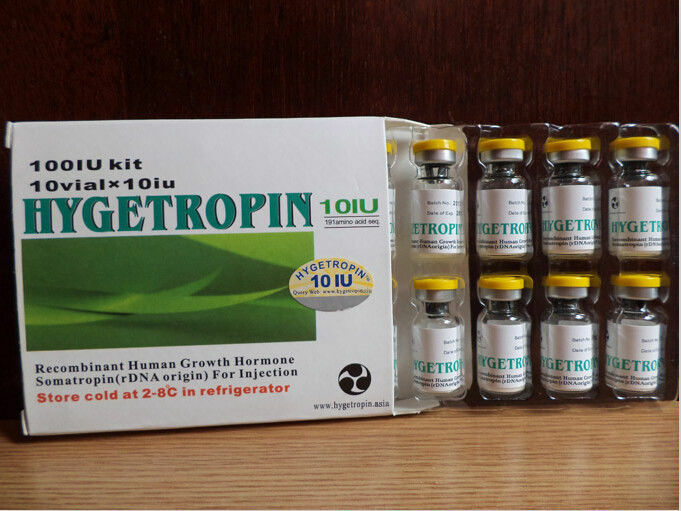 Hygetropin should be used with sterile bacteriostatic water for injection. The water acts as a solvent to dissolve the powder inside the vial and turn it into an injectable solution. Use a new sterile syringe (pin width should be 19G-27G) to pull solvent into syringe (1ml of water or less) Inject the water very slowly in a controlled manner to the side of the vial and let the water slide down the bottom of the vial. Do not push the water directly onto the GH powder! Doing so will damage it. Gently dissolve the drug with a slow, swirling motion. Do not shake vigorously, or the active ingredient might denature. Inspect to see if there is still powder at the bottom of the vial, you may need to let the vial in room temperature for a few minutes in order for powder to dissolve completely.